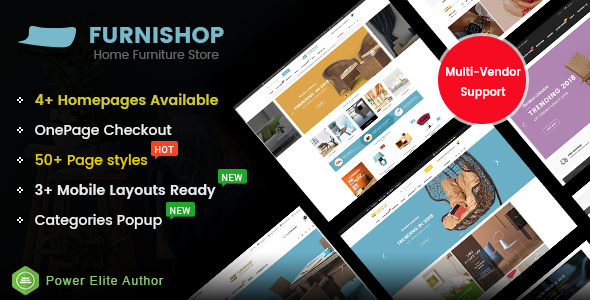 Based on OpenCart 3, FurniShop is coming with multi-homepage designs for multipurpose of any store. It is fully customizable and high quality with a bundle of powerful functions. It not only includes many powerful features, but also support multi- vendor plugin from Purpletree Software Author. This OpenCart 3 theme is built for any trending HiTech Shop, Fashion store,or any eCommerce site, especial for Furnture shop. + Modern Design: Multi-homepages, highly responsive, mobile layouts ready, unlimited colors, negamenu built-in, beautiful slider, countdown slider, featured product blocks, product listing tab, etc. Especially, 50+ page styles also supported. + One Click Installation: Import the demo of design you want to have your site just like demo with few steps. + Dedicated Support: Contact us anytime at our Official Support System to get help in 24 hours (Every Business days). An interesting category of theme which I believe may bring great interest to the people. Although, one comment I would like to add is about adding more screenshots on the Marketplace since furniture may be lead to a huge subject. Why can't anybody do a web theme which would actually abide by the OpenCart standards?